Perspective is a relationship between the size of an object, its distance, and its apparent/angular size. The angular size is larger if the object is closer or larger. 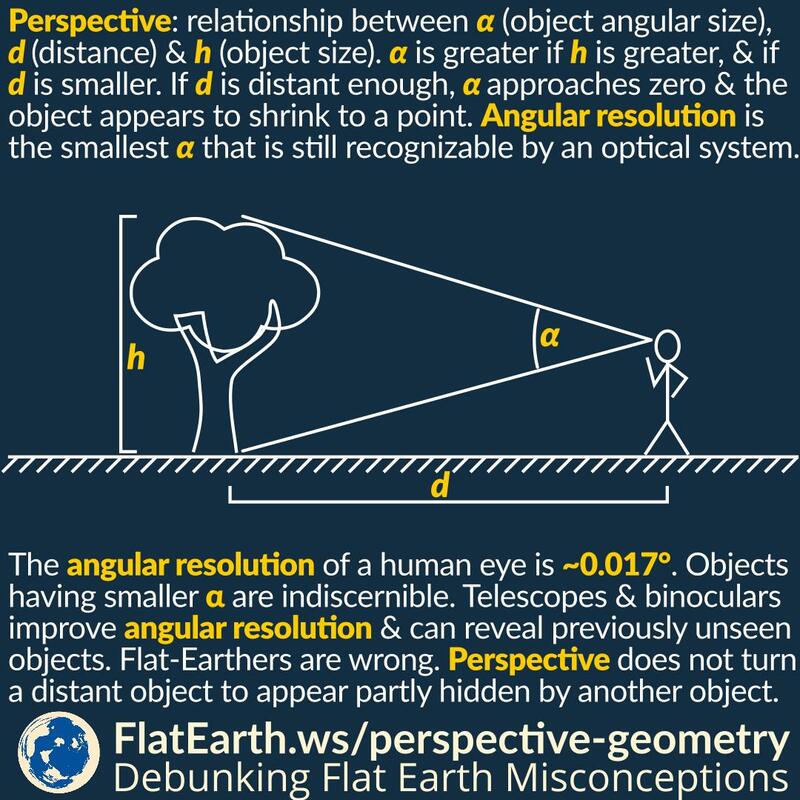 Often, flat-Earthers would claim that we cannot see a distant object is not the result of Earth’s curvature, but because of perspective. In a way, it is correct to say that perspective might result in an object having angular size too small to be seen by our eyes. However, perspective alone cannot ‘hide’ a portion of an object, while revealing the rest of it. If the object is distant enough, its angular size approaches zero, and the object appears to shrink to a point. Angular resolution is the smallest angular size that is still recognizable by an optical system. The angular resolution of a human eye is about one arcminute or about 0.017°. If an object has the angular resolution smaller than one arcminute, our eye would not be able to recognize the object. To increase the object’s angular size, we have to approach the object. Or we can use an optical aid, like a telescope or a binocular. These will improve angular size, and objects with smaller angular size will be easier to discern. A receding object has a continuously diminishing angular size. If its angular size goes below the limit of our angular resolution, the object will no longer be recognizable. If there’s no barrier, the object would appear whole the entire time until its angular size is too small for us to recognize. In this case, we say the object disappears because of perspective. In other cases, a receding object appears whole at first, then at some point, a portion of it becomes unseen, and as it goes farther, more of it becomes unseen, all while leaving the rest of the object visible. Such cases are not the result of perspective. The angular size of the object is still higher than our angular resolution. The object gradually becomes unseen because of obstruction from another object, like the curvature of the Earth. Objects with an angular size smaller than our angular resolution still emit photons, and they can still reach the retina in our eyes, or the sensors in our cameras. If the background is dark enough, the object will be visible, but we cannot recognize their shapes. Stars are like this. Their angular sizes are far below the angular resolution of a human eye. 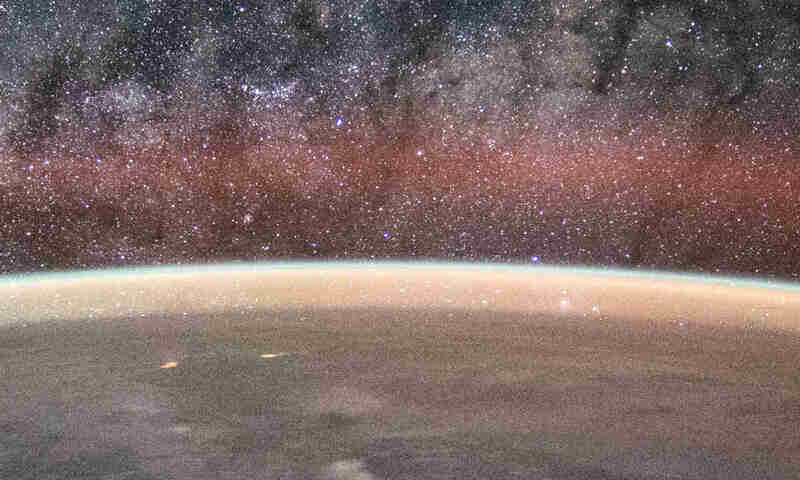 But because the night sky is dark enough, stars are still visible, even if we cannot possibly recognize their shapes.